The Scotty dog gummies put these cupcakes over the edge. Happy Friday. I didn’t post yesterday, but I was in a limited internet situation. I’m not sorry. I was also in a limited bathroom situation (no, I was not in prison), so I had to go to the Brite Spot diner in Echo Park. To pee. Side note: The Brite Spot is really cute, and I would like to legit eat there soon. During my quick jaunt I checked out the baked goods (and bought one for my boss, as my entree to the bathroom… not because I actually had to, but out of guilt). 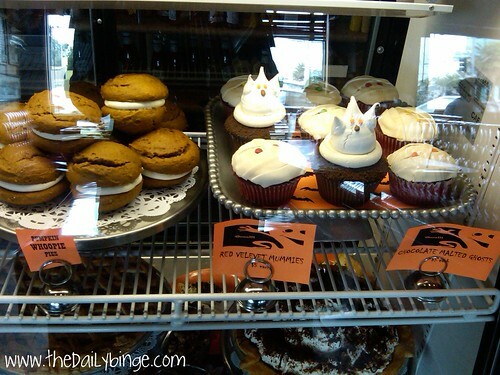 I was going to buy a cupcake for myself, too, but I was overwhelmed by the frosting/decorations. And I hadn’t eaten lunch. That much sugar on an empty stomach was potentially fatal. But the cupcakes were quite a site to look at, and I was thinking of you! 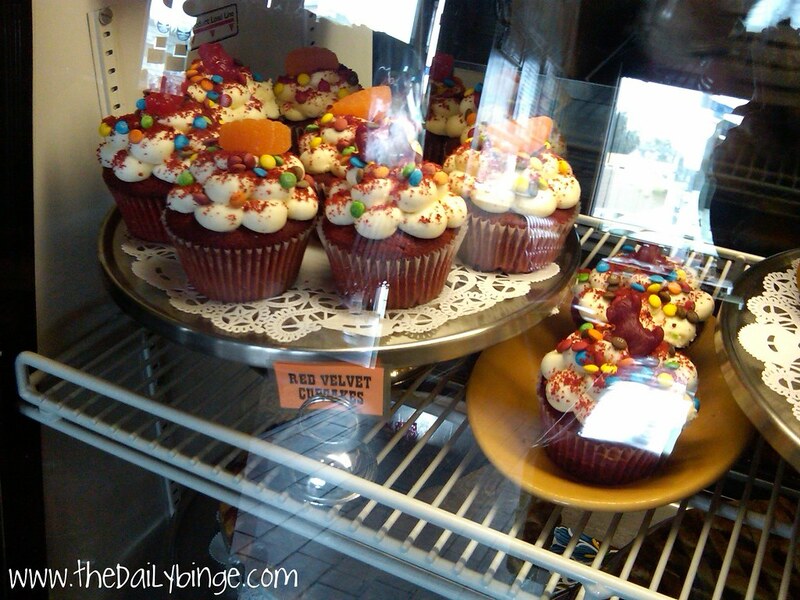 The red velvet mummies had less frosting, but they cost more just because they were Halloween-themed. I flaunted them on principle. Or maybe I’m finally accepting my red velvet identity crisis situation, and just not feeling obligated to love red velvet unconditionally. Also ALSO also overwhelming: My pumpkin bagel this morning. 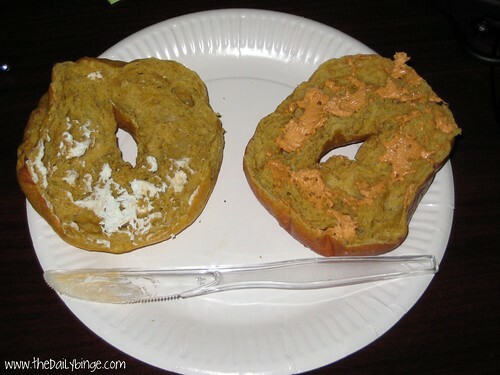 Yes, that’s pumpkin bagel with pumpkin cream cheese. And also regular cream cheese, and (invisible) butter (because I toasted it). I was still full from the bagel during lunch, which was unfortunate because it was LudoTruck. Ludo is famous for having a pop-up restaurant that floats around Los Angeles (LudoBites). Unfortunately the truck is mostly fried chicken, and I’m not a big fried chicken person, and I was full. But I took a picture of Bryan’s lunch, for you Ludo-foodies– if you’re out there.